A friend works for The Roy Castle Lung Cancer charity – they do some brilliant work, so when she asked me to help them with an event, it was a delight. Every bride secretly wishes they could re-live their special day and wear that fabulous dress just one more time – and now they can! The average cost of a wedding dress in the UK is £1340, yet the bride only gets to wear it once. After all the tears and tribulations involved in finding the right dress, and all the primping, planning and preparation invested in making sure they look and feel fabulous, most brides say that that their special day flies by far too quickly. 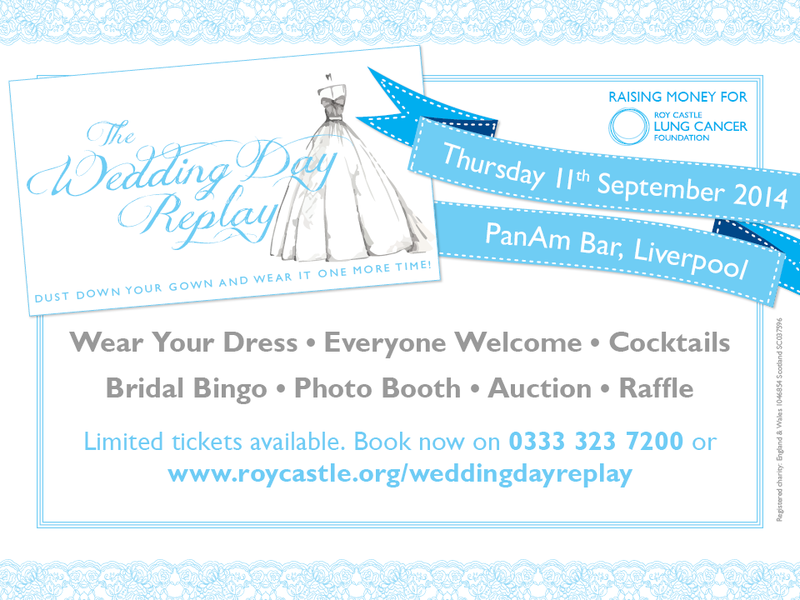 The Roy Castle Foundation is hosting a very special one-off event; inviting brides across Merseyside to get THAT dress out of the loft or off the top of the wardrobe and to wear it one more time. And the Wedding Day Replay is not just open to brides, because bridesmaids, Maids of Honour, Mothers of the Bride and bridegrooms are all invited too! This is an opportunity for all Leading Ladies and their female friends and relatives to get dressed up and feel as glamorous as they did on their ‘special day’. Some may have outgrown their gowns, or had them re-styled – while other dresses might have suffered damage ‘on the day’ – so the event will feature spot prizes to recognise the challenges involved in recreating the original fairy-tale. Categories will include: ‘Most creative method of fitting into a dress’, ‘Most unusual stain’ and even ‘Best Charity Shop Outfit’ – for those who may have sold their original gown! The event will take place on Thursday 11th September at the Pan Am Bar in Liverpool. Tickets are priced at £20 and guests will receive two complementary cocktails.